Today, we start counting down all the 2016 movies I watched from worst to best. Here's the bottom of the barrel. 2016 was a year of ill-advised sequels that no one asked for. I managed to avoid a few of those (like Independence Day 2) as well as some that we definitely asked for, but by all reports turned out to be no good (Jason Bourne). A couple of them got me though. 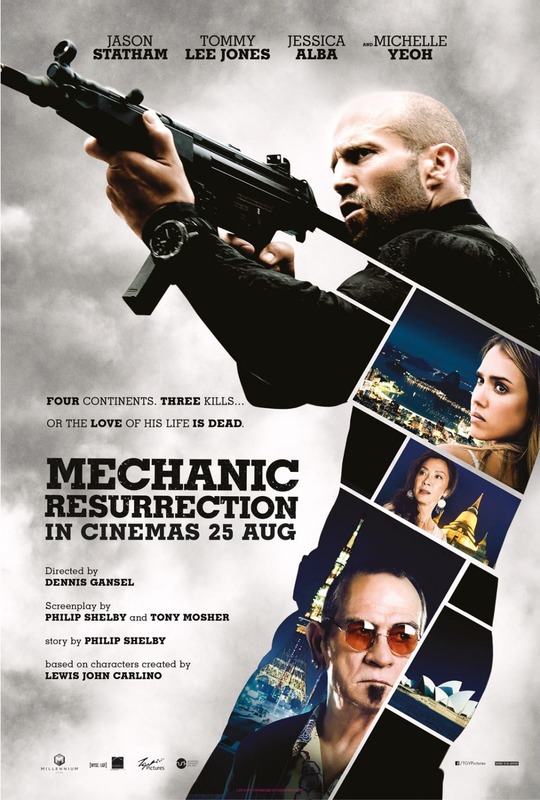 Even though I enjoyed the 2011 Mechanic remake, I wasn't exactly clamoring for more, but I like Jason Statham enough that Resurrection got me to the theater. And for a while, I was really impressed. The film starts in Rio and uses a landmark that brought Moonraker to mind and put me in the mood for a big, fun action movie. A pretty cool fight and a very cool stunt later, and I was hooked. I was still into it when Statham's character went to Thailand to hang out in some very Man With the Golden Gun-looking islands with Michelle Yeoh (reminding me of the best part of Tomorrow Never Dies). Were were still all good. But then Jessica Alba showed up. I don't dislike Alba as an actor; it's the script's problem. Up until her appearance, the movie is about Jason Statham's staying one step ahead of his enemy and refusing to get back into the assassination business. But then Alba reveals that she's been recruited (seemingly at random out of literally everyone on the planet; there's no compelling reason for the villain to have picked her in particular) to seduce Statham so that when she's later "kidnapped" by the bad guy, he'll have leverage over Statham. Even knowing this, Statham falls in love with her anyway because of a wedding dance and the rest of the movie plays out exactly as Alba predicted it would. You don't even have to have seen an action movie before to know what's coming. Her character literally tells you in the first act. From there, I was just bored. This is a good-looking movie with great actors who are doing and saying ridiculous nonsense. There are some good action sequences in some cool period settings, but they're completely undercut by constant visual reminders that what's happening isn't real and that there are no stakes. 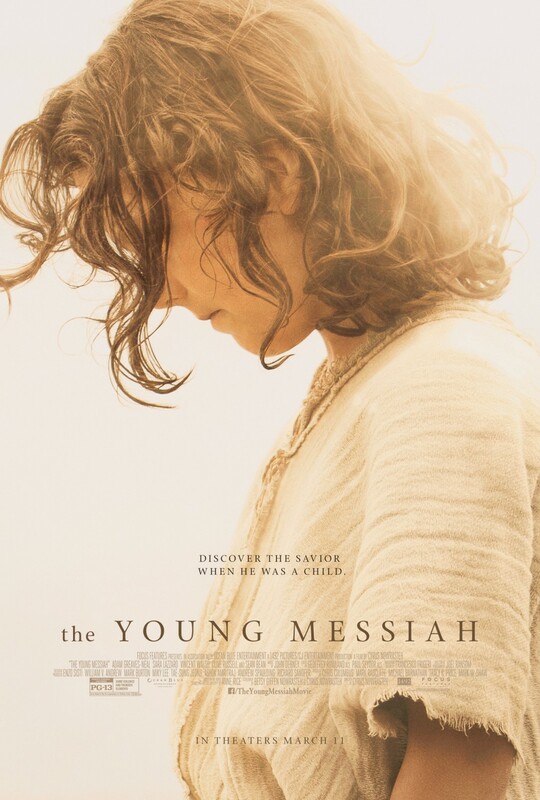 A fan fiction prequel to Jesus' story that promises to explore his coming to terms with his role as the Messiah. Sadly, it doesn't actually deliver that. Really it's just his learning the facts around his birth, so that he discovers that he is the Messiah, and then there's a bit of voiceover monologue at the end where he explains what he thinks that's about. I was hoping for something more thoughtful. Excellent performances all around though and I especially like the character arc given to Sean Bean's centurion. The set up for that story is kind of ridiculous and very contrived: Herod the Great's mad son orders Bean to seek out and murder the legendary child who escaped the massacre of infants seven years ago in Bethlehem. But having Bean's character be one of the soldiers who was in Bethlehem that night makes for a compelling story as he wrestles with his past and has to decide if he's going to repeat it. I was surprised and completely charmed by the first movie in 2002, so this was a sequel I was actually looking forward to, regardless of what the critics had to say (and they didn't say nice things). Besides, there was at least one of other widely maligned comedy sequel in 2016 that I enjoyed quite a bit. Revisiting the original in preparation for this, though, I was concerned by how some of my fondness for it had expired. The original is still very sweet and often funny, but I think a lot of its surprise was because of how it stood out among other romantic comedies of the early 2000s. Watching it today, when almost all romantic comedies are quirky and low-budget, it doesn't feel as fresh. I still quite like it though. The sequel, on the other hand, tries to do too much. The first one knows exactly what story it's trying to tell and has no problem focusing on it. This one is sort of about Toula's relationship with her daughter, sort of about her daughter's relationship with the rest of her family, sort of about Toula's relationship with her family and how that affects her relationship with her husband, and sort of about her parents' relationship with each other. As much as I enjoyed seeing these characters again, the movie should have picked one - or maybe two - of those plots. Pretty funny, but the first one had the advantage of surprising me with an actual story. This one tries to do some of the same stuff - to be about something - but isn't as deep (if "deep" is the word I even want to use for the first one). The first one dealt with Seth Rogen and Rose Byrne's crisis about growing older and uncool. The sequel deals with their fears about being bad parents. But the thing is, they really are horrible parents, so I don't care to see them make their peace with that. I'd rather see them learn to become good parents. I do like the girl power angle of the story though and I found it easy to root for both sides of the war. Speaking of wars, this was better than I expected, but that's a really low bar. It's built on the very shaky foundation of Man of Steel, which presented a brooding, selfish Superman. Because of that, the citizens of this world can apparently only react to him in one of two ways: god or monster. One character in Batman v Superman pays lip service to a third option: that he's just a man doing the best he can. But that's not really explored. In order to get the fight of the title in, Batman is forced to see Superman as a monster, but in an unconvincing way that makes Batman seem pretty dumb. So most of the movie is a bunch of people acting really shallowly or stupidly. Lex has an interesting point of view - that Superman is a god and therefore must be treated as a monster - but Lex is so clearly insane that it's hard to take him seriously either. He's basically the Joker Lite. Without anyone to care about, there are no stakes and most of the film is pretty dull. That changes somewhat once Lex's plan finally becomes active though. There's suddenly something to lose (in a contrived and cliche way, but still) and some of the action scenes are pretty cool, if not particularly thrilling. Affleck makes a fine Batman and I'm interested in seeing a solo film with him as long as Snyder and Goyer aren't creating it. Almost as interested as I am in the Wonder Woman film. 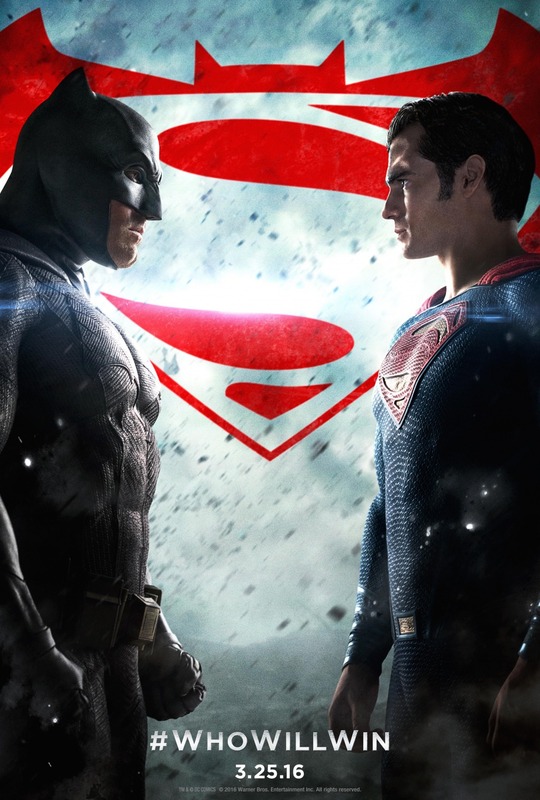 BvS only teases what the character will be like, but so far so good (and the trailers give me even more hope). I'm also hopeful about Aquaman's movie, but will need convincing about the Flash and Cyborg. Mechanic Resurrection - I too enjoyed the first one and was hoping for a fun followup. What I got was nonsensical garbage ruined ENTIRELY by Jessica Alba. Ubsurd. 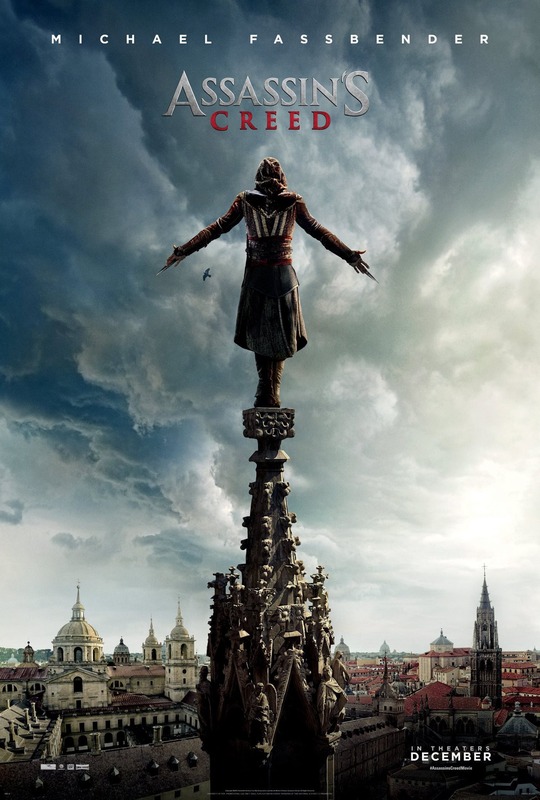 Assassin's Creed - No, don't tell me that. I'm really looking forward to this. I love the concept of the game (though I've never played it) and I love Fassbender. My Big Fat Greek Wedding 2 - I surprisingly enjoyed the first. I didn't ask for nor did I want a part 2. Neighbors 2 - I really enjoyed that first one even though I'm not even a big Seth Rogen fan. I just don't think he's that funny. I like the angle they are taking with the Soroity, but it feels like it's going to be the same movie. But I've been in love with Zac Efron lately. But again, I'll miss Dave Franco. BvS - I've said my peace. Having a nose for bad films, I've steered clear of 4 of these (well, one of them I hadn't even heard of, I'm not in a market where Christian films are much of a thing) and only saw BvS for podcast reasons. I did like Neighbors 2 though, but I think in some part because I hadn't seen the first one (I would see it later on Netflix and like it as well though, I agree, the retread a lot of the same ground). It wasn't my favorite favorite "stupid comedy" of the year though, there was another more surprising one, and I hope to see it higher up on your list. Pax, I feel the same way about Seth Rogen. I try to limit myself to one of his movies a year, but sometimes even that's too much. Dave Franco does have a small role in Neighbors 2 though. He's not in it a lot, but he does appear more than once. I love that guy, too. Siskoid, I'm curious to know what your favorite stupid comedy of the year was. There are a couple in my Middle-of-the-Pack list today, so I wonder if one of those could be it, but there are a couple more comedies that I'll mention next week, so maybe it's one of them.